Climbing Mount Kilimanjaro is something I had been dreaming about for as long as I can remember. It was a distant dream but on my very real list of things to do before I die. I told myself, ‘One day I’ll do that,’ until one day all of my dreams became buried in an avalanche of fear. Five years ago, on Oct. 30, 2013, I was diagnosed with breast cancer. That’s the day when my to-do list shrunk to just one single goal: survive. Fate had a different mountain for me to climb and for a year, that meant traversing doctors, decisions, surgeries, chemotherapy and medications. What followed was an even steeper climb, a mountain of fear. I no longer trusted my body. I no longer felt invincible. I was weak and vulnerable, afraid to plan for any future. Slowly, with incredible support from my family, friends and other survivors, I began to build back my physical strength. I began working out again. I ran my first half marathon, and more importantly, I realized I wasn’t jinxing my health to believe I could be stronger than before cancer. My physical fitness started to bolster my mental courage. I began to hope again. That’s when my dream of summiting Kilimanjaro came back to me. I asked my closest family and friends to come with me, on my five-year “cancerversary,” to celebrate pushing past fear by pushing ourselves beyond discomfort and pain to stand on top of Africa! And amazingly, they all said yes! We spent the summer hiking, running, walking and weight training to prepare for our October summit. Our group ranged from 12 years old to 65 and we were all in the best shape of our lives. But Mount Kilimanjaro’s biggest obstacle is altitude. A group of us spent a week in Peru this June hiking the Andes on the Lares Trek to try to prepare for the effects of mountain sickness. We got up to 15,000 feet and felt confident about Kilimanjaro. 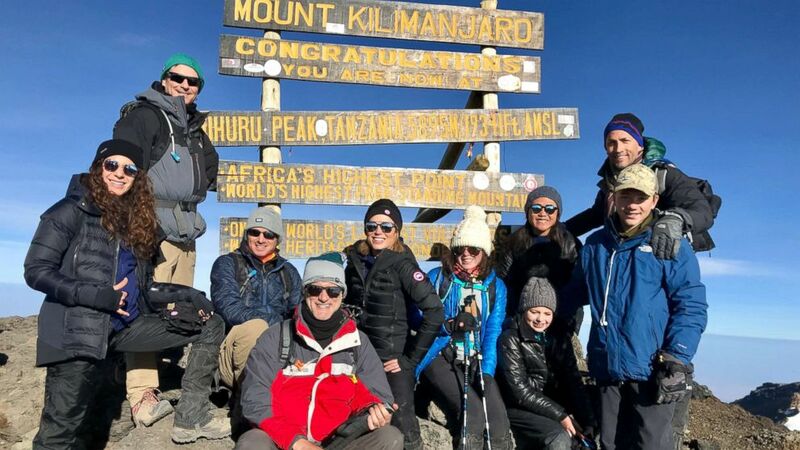 But Uhuru Peak stands at 19,341 feet and despite all of our preparations, nearly every one of us fell prey to altitude sickness between 17,000 and 19,000 feet on our final summit night. My dad, my brother and my husband somehow evaded most symptoms but the rest of us either vomited, felt massively fatigued, had excruciating headaches or experienced a combination of all three! Despite those symptoms, miraculously all 10 of us made it up to the peak and we did it together, by simply putting one foot in front of the other. For seven hours, starting at midnight, in subfreezing conditions and after hiking four full days through five climate zones, we did it! What an accomplishment and life lesson: one step at a time, one day at a time, savor each moment along the journey — both the good and the bad – and relish the people walking with you every step of the way.